Tradie Underwear is made for hard working Tradies; extra comfortable and designed to enhance your rugged good looks. 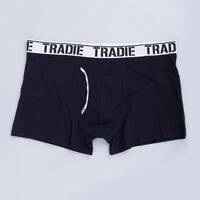 Everybody knows - Ladies Love Tradies - and they’ll love you even more in a pair of Tradie Underwear. Our underwear is designed specifically with Tradies in mind, ensuring there’s plenty of room to move, comfort and durability. The fitted trunk is original Ultimate Toolbox!